JEE Main Result 2019 to be expected by the end of this week as per the past trends followed by NTA. 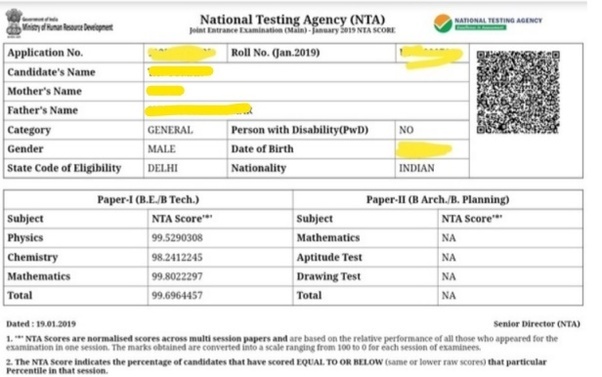 The National Testing Agency (NTA) has already displayed the JEE Main Answer Key 2019 and JEE Main Question Paper 2019 at jeemain.nic.in. Candidates were also allowed to raise objections against the Answer Key by April 16. In January session, the result of the exam was released two days after the closing of objection window. Thus, we can expect the result by April 20 as this time, the National Testing Agency will have to declare JEE Main Rank 2019 along with the NTA score of April exam. NTA will consider better of the two NTA Scores of all candidates who appeared in both Jan 2019 and April 2019 examinations. The Paper I of JEE Main 2019 was conducted from April 8 to 12 (except April 11) in fully computer based test mode at 470 centres. 6, 68, 485 candidates out of 9, 35, 741 (71.42 per cent) appeared for Paper 1 in January as well as in April, as per NTA statistics. The row score will be calculated by NTA on the basis of the marking scheme of the examination. For each correct answer marked by the candidates 4 marks will be added, while for each incorrect answer, 1 mark will be deducted from the total score. The row score of each candidate for each subject (Maths, Physics and Chemistry) will be calculated by the National Testing Agency. Gurmeet appeared for the first shift of JEE Main 2019 on April 8 in which a total of 1, 00, 000 students appeared. She scored marks as per the marking scheme. The percentile scores will be obtained by converting the raw marks into a scale ranging from 100 to 0 for each session of examinees. The Percentile score will be the Normalized Score for the examination (instead of the raw marks of the candidate) and shall be used for preparation of the merit lists. Note:- The Percentile Scores will be calculated up to 7 decimal places to avoid bunching effect and reduce ties. Here, T1, M1, P1, C1 are the raw scores in Total, Mathematics, Physics, Chemistry of a candidate. (a) Candidates obtaining higher Percentile Score in Mathematics will get higher rank. (b) Candidates obtaining higher Percentile Score in Physics will get higher rank. (c) Candidates obtaining higher Percentile Score in Chemistry will get higher rank. (d) Candidates older in age will get higher rank. What after JEE Main Result 2019? The first session of JEE Main 2019 was conducted from January 8 to 12 and the result for the same has been released within one week after concluding the exam. JEE Main Result 2019 to be expected by the end of this week as per the past trends followed by NTA.